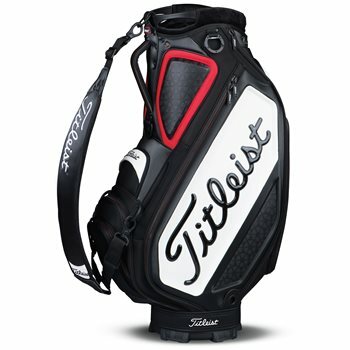 The Titleist Tour staff bag is constructed with lightweight high quality materials. It features a 9.5” 6-way top for club organization and integrated handles for easy lifting. Other features of the bag include an improved hip pad design, a new adjustable ergonomic strap system with high-density cushioning foam, a recessed script panel and an ergonomic handle. The Tour staff bag is equipped with 10 pockets for superior storage capacity. Two pockets are quick-release magnetic pockets and the zippered pockets feature military-grade zippers.